The European Foreign Policy Scorecard is an innovative project that provides a systematic annual assessment of Europeâ€™s performance in dealing with the rest of the world. The scorecard assesses the performance of the 28 member states and the EU institutions on 66 policy areas arranged around the six key themes below. 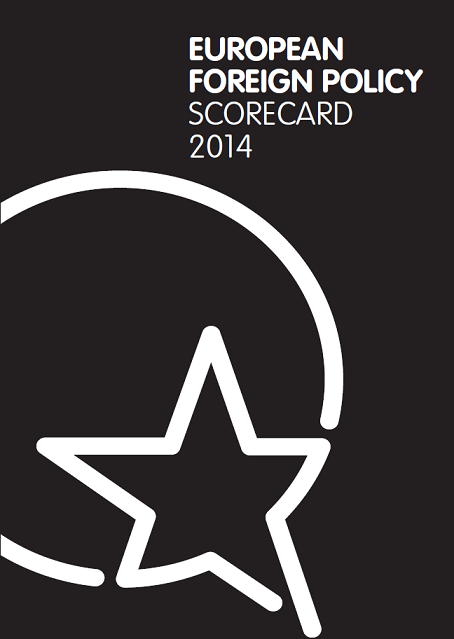 Click here for the PDF, the Kindle, or the EPUB version of the Scorecard. Performance in relations with China improved after a successful EU-China summit and promising co-operation on Syria, Mali and the Iranian nuclear problem. But the solar panel case showed member states were willing to undermine the European Commission on economic issues. Performance in relations with Russia worsened as Europeans struggled to respond to increasing pressure on Eastern Neighbourhood states. European resolve on energy issues did not lead to successful diversification of energy. 2013 was a year of breakthroughs in the transatlantic relationship, with the launch of TTIP negotiations and co-operation on an Iran nuclear deal. But a failure to work together on the Syria crisis and the fallout of the Snowden revelations cancelled out the positive developments in overall performance. Performance improved this year as Croatia joined the EU and High Representative Ashton facilitated a historic agreement between Kosovo and Serbia. Relations with Turkey were also mildly encouraging, but setbacks in negotiations with Ukraine and Armenia showed that Europe needs to find a way to respond to Russian pressure. Except for involvement of the E3+3 in successful nuclear negotiations with Iran, European performance in the southern Mediterranean was disappointing again. The irrelevance of the ENP to major developments in the region became clear, especially in Syria and Egypt. Fast-moving crises and complex multilateral negotiations tested Europeans in 2013. France intervened in Mali and CAR but only got limited support from other member states. Diplomatic efforts on Syria and climate issues were disappointing and there were new challenges in crisis management.